A tropical landscape will be lush, bright and bold. Tropical gardens are influenced by trends from different continents, from the tropical islands to the rainforest. Successful tropical landscapes will be a blend of both colours and textures. A warm, humid climate is the basic condition for a tropical landscape. The resort style tropical landscape will depend on the set up, and plant selection. Creating the layers of canopy, sub-canopy, under storey and ground cover gives depth to the design. The lush evergreen foliage of broad leaf plants, for example agaves, palms, bananas, and taro will form the backbone of the garden. These will provide the shade to enhance the growth of plants of the lower layers like bromeliads and hostas. 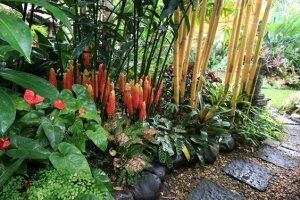 Bright coloured foliage and flowers in the tropical landscape can include Cannas (var Tropicana), Bromeliads, Flaxes, and grasses, or by variegated varieties. Climbers like bougainvillea, or mandevilla can provide a colourful backdrop. The texture of the varying foliage influences the amount of light reflected or diffused by the plants, and gives that lushness that we expect to see. The scent produced by gardenia or frangipani flowers provides a welcome addition when planted close to your patio. 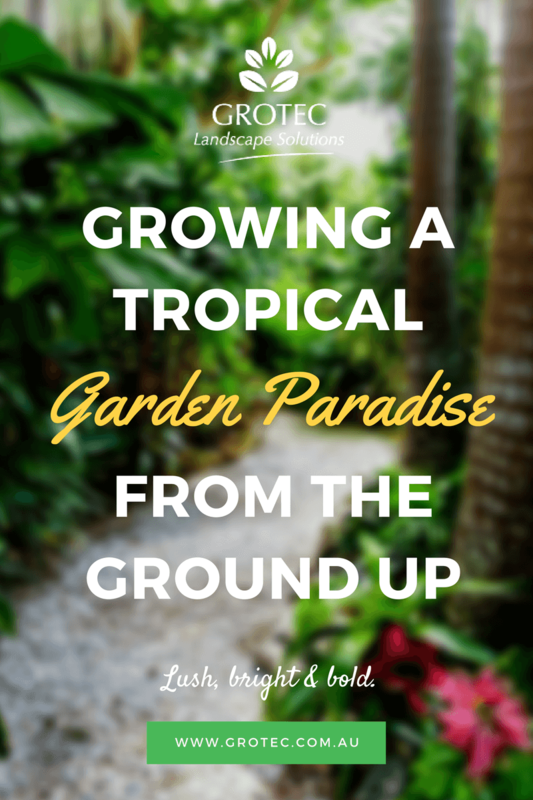 Let Grotec advise you on creating your own tropical landscape paradise. A water feature of some sort is often included in these designs, if a natural source – pond, stream, waterfall – is not available. The size and shape will depend on the space available, and your budget. Stone or resin fountains can form an important part of the tropical landscape. Once established, a tropical landscape requires very little on-going maintenance. The variety of the plants used will be dependent on the situation; whether your garden is sheltered or exposed, in full sun or part shade. As with other forms of landscaping, ‘less is more’, and the landscapes are completed with the addition of pots or urns, pebbles, rocks, or crushed shell. 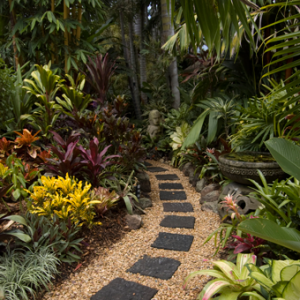 Dark coloured pavers, for example, set in light coloured pebbles, and the paths meandering through the garden will reinforce the tropical nature of the spaces. Let Grotec create a resort–style tropical landscape for you.